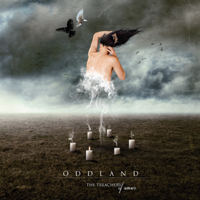 I reviewed the 3 track Oddland promo back in April of 2010, and back then I wrote: "Hopefully some label executive hears the same creativity and promise from these three intense and captivating songs that I did.". And now two years later my hopes have come true; Oddland is releasing their debut album on Century Media. All three songs that made me wanting to hear more have made it onto their debut album ("Above and Beyond", "Still the Spirit Stays" and "In Endless Endeavour") along with seven new songs. Musically we are still in the classic progressive metal ball park: Fates Warning, Dream Theater etc. mixed up with some Pain of Salvation (old) influences as well as some references to more power metal sounds like we hear from Communic. Powerful progressive metal with many fine power chords, a very good production and one the more interesting new vocalists is on offer here, and I am sure that fans of the above mentioned bands will find this equally interesting. A solid debut album from Finland.